"I've always heard, 'Well, he just stands there and sings.' Well, what do you want me to do? With the songs that I sing, I can't go running across the stage. And I don't talk a lot onstage, either. But I do play a lot of songs." George Strait doesn't write his own songs, but he knows how to pick the best songwriters, as witnessed by his 56 number one songs. Some songs that George has recorded over the years are from Bryon Hill ("Fool Hearted Memory"), Mack Vickery ("The Fireman"), Steve Bogard ("Carried Away"), Dean Dillon ("The Chair"), Rodney Crowell ("Stars on the Water"), Jim Lauderdale ("We Really Shouldn't Be Doing This"), and Bob DiPiero ("Blue Clear Sky"). Merle Haggard, Bob Wills & His Texas Playboys, Hank Williams, George Jones, Frank Sinatra. "I've always wanted to do a totally swing album," George says. "Maybe someday I'll do an album of old Sinatra-flavored swing with a huge band." "All My Exes Live in Texas"
"Carrying Your Love With Me"
George Harvey Strait was born on May 15, 1952, in Poteet, Texas. He was raised on a cattle ranch and spent the summers working on the ranch with his parents, brother and sister. When he was in third grade, his parents divorced. His mother took his sister to live with her, while George and his brother stayed with his father. During high school, Strait was part of a rock band but soon turned to country music. After high school, he entered college at Southwest Texas State University, but dropped out and eloped with his high school sweetheart, Norma, in Mexico. Next, George enlisted in the Army and was stationed at Schofield Barracks in Hawaii. He began playing in a country band while in the military. 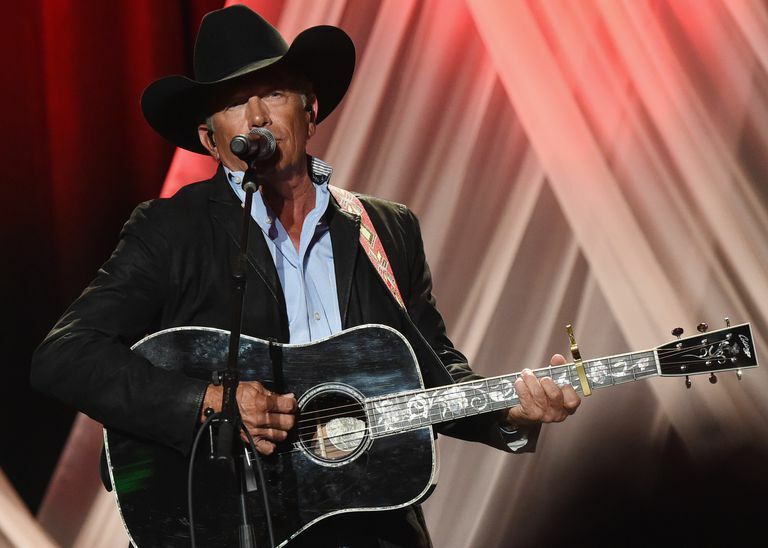 After being honorably discharged in 1975, Strait and his family moved back to Texas, where he enrolled once more in Southwest Texas State University, and he graduated with an agriculture degree in 1979. It was while he was at college that he joined the Ace in the Hole band, becoming their lead singer. The band played local clubs, and Strait ran a cattle ranch during the day. He also met and became friends with Erv Woolsey, who had once worked for MCA Records. Woolsey used his Music Row connections to invite some execs to Texas to hear the band play. MCA was impressed with Strait and signed him to the label. The Ace in the Hole band continued to play with Strait as his backup band. In 1981, Strait released his first single, "Unwound." The song did very well, reaching the Top 10. After a second single stalled, his third single, "If You're Thinking You Want a Stranger (There's One Coming Home)," became his first Top 3 song. This began a string of Top 10 songs that lasted into the 1990s. His first No. 1 song was "Fool Hearted Memory," and through the 1990s, he had a total of 31 No. 1 hits. By the mid-1980s, Strait was winning awards, such as the CMA Album of the Year, in 1985, for Does Ft. Worth Ever Cross Your Mind to his win for CMA Entertainer of the Year in 1989 and again in 1990. Strait has acted in several motion pictures, including a bit part in 1982 in The Soldier, and probably his most well-known part, as the star of in 1992. In 1995, Strait released -- a four-CD box set. This became the second biggest selling box set ever. Other albums followed annually, starting with Blue Clear Sky in 1996, then One Step at a Time, Always Never the Same, and George kept going strong, scoring 50 Number One Hits, and then surpassing that with six more as of the writing of this biography. Always a big touring act in the 1990s, he headlined the George Strait Country Music Festival taking rising stars on tour with him, who went on to become superstars themselves -- stars such as Tim McGraw, Kenny Chesney, the Dixie Chicks, Faith Hill, and Alan Jackson. Strait continues to record and tour today, still racking up Top 5 hits left and right. For the man people call "King George," It Just Comes Natural. Is Marty Slayton Still Singing?